THIS SITE AND ALL CONTENT ARE DISTRIBUTED AND TRANSMITTED ON AN “AS IS” AND “AS AVAILABLE” BASIS, WITHOUT WARRANTIES OF ANY KIND, EITHER EXPRESS OR IMPLIED, INCLUDING, WITHOUT LIMITATION, WARRANTIES OF MERCHANTABILITY OR FITNESS FOR A PARTICULAR PURPOSE. While Empathetics uses reasonable efforts to include accurate and up to date information on this Site, Empathetics is not responsible or liable for any infections or contamination of the system you utilize to access this Site, or delays, inaccuracies, errors, or omissions arising out of your use of this Site or with respect to the information and Content contained on this Site. TO THE FULLEST EXTENT PERMITTED BY APPLICABLE LAW, EMPATHETICS, ITS SUBSIDIARIES AND AFFILIATES, AND THEIR RESPECTIVE OFFICERS, SHAREHOLDERS, DIRECTORS, EMPLOYEES, AGENTS, LICENSORS, AND/OR REPRESENTATIVES WILL NOT BE LIABLE FOR DAMAGES OF ANY KIND INCLUDING, WITHOUT LIMITATION, COMPENSATORY, CONSEQUENTIAL INCIDENTAL, INDIRECT, SPECIAL OR SIMILAR DAMAGES, THAT MAY RESULT FROM THE USE OF, OR THE INABILITY TO USE, THE CONTENT CONTAINED ON THIS SITE WHETHER THE CONTENT IS PROVIDED OR OTHERWISE SUPPLIED BY EMPATHETICS OR ANY THIRD PARTY. Notwithstanding the foregoing, in no event shall Empathetics’ liability for any and all claims, damages, losses, and causes of action (whether in contract, tort or otherwise) exceed the greater of One United States Dollar or the amount, if any, that was paid to Empathetics in order to access this Site. Please note that some jurisdictions may not allow the exclusion of implied warranties, so some of the above exclusions may not apply. Check your local laws for any restrictions or limitations regarding the exclusion of implied warranties. To ensure compliance with the Digital Millennium Copyright Act (“DMCA”) and other applicable copyright laws, Empathetics will take action on receipt of notice of alleged copyright infringement. If you are a copyright owner or representative of the owner and believe that a user has submitted or uploaded material that infringes upon your copyrights, you may submit notification in accordance to the DMCA by providing Empathetics with the following information in writing: (a) identification of the copyrighted work claimed to have been infringed, or, if multiple copyrighted works are covered by a single notification, a representative list of such works; (b) identification of the claimed infringing material and information reasonably sufficient to permit us to locate the material on this Site (such as the URL(s) of the claimed infringing material); (c) information reasonably sufficient to permit us to contact you, such as an address, telephone number, and, if available, an email address; (d) a statement by you that you have a good faith belief that the disputed use is not authorized by the copyright owner, its agent, or the law; (e) a statement by you, made under the penalty of perjury, that the above information in your notification is accurate and that you are the owner of an exclusive right that is allegedly infringed or are authorized to act on the owner’s behalf; and (f) your physical or electronic signature. Please send all written correspondence of alleged infringements to: Empathetics, Inc., 745 Atlantic Avenue, 8th Floor, Boston, MA 02111. You may also contact Empathetics’ copyright agent by email at tmisiaszek@empathetics.com. Empathetics has not reviewed the sites linked to this Site and is not responsible for the content of any websites owned or operated by third parties. Please note that when you leave this Site, you do so at your own risk. remove, disable access to, or modify any content or resource that violates this Policy or any other agreement we have with you for use of this Site or any Empathetics service. This Site is intended for residents of the United States and other countries permitted by applicable law. No software from this Site may be downloaded, exported or re-exported in violation of any law including, without limitation, to countries that are subject to U.S. export restrictions. Last modified: September 1, 2015. Start learning how to implement empathy in your organization. Addressing Generational Differences in Nurse Teams, Improving Nurse-Patient Communication, Improving Inter-professional Team Communication and Interactions. Focuses on front line staff situations and scenarios. Featuring Informed Consent and the Preoperative Conversation. Workshop to train your team members on how to facilitate course discussions. The live training and facilitator's guide provides a framework for a blended learning experience by incorporating group exercises, group process, role playing and experiential learning. This blended learning strategy serves as an opportunity to deepen the Empathetics web-based curriculum by allowing participants to apply their learning to actual patient interactions that have challenged their own confidence and empathy. Quick access to helpful tools, breathing exercise, and more. 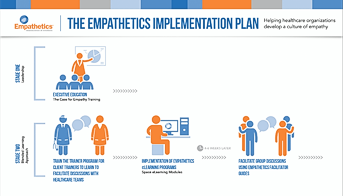 Learn how your organization can implement Empathetics to create a culture of empathy. Copyright ©2019 Empathetics, Inc. All Rights Reserved.